Jay and I recently spent a weekend in Paris and, as is always the case when I travel, the thing I was most excited about was all the great food I was going to get my hands on. As a huge city, I barely even scratched the surface of the great eats Paris has to offer, but I certainly enjoyed all of the foods I did manage to try. So, aside from all of the baguettes I chomped my way through (and believe me, there were a lot) here are some of the vegan foodie highlights from my time in Paris. The first place on my foodie bucket list was Cloud Cakes - a fully vegan café offering vegan croissants, cakes and pastries galore! And, let me tell you, I was not disappointed because everything I tried here was beyond delicious. On our first visit to this café I was d-e-l-i-g-h-t-e-d when I spotted vegan almond croissants (aka my dream) but my hopes were quickly dashed when the person in front of me in the queue ordered the last two - heart broken would be an understatement. But, after putting my devastation to one side, I ordered one of their regular vegan croissants and a hot chocolate and man, oh man, was it good! The croissant was warm, flaky and tasted SO buttery and paired with a sweet hot chocolate I was living the dream. After polishing off our brunch, I also ordered a red velvet cupcake and a chocolate brownie to take away. Although by the time I managed to eat it, the cupcake was sufficiently smushed, it still tasted delicious and had the fluffiest texture. The brownie, although much richer and gooier than the cupcake, was equally delicious and, with a combination of chocolate chunks and walnuts was everything I could ever want in a brownie. Because our first experience at Cloud Cakes was so good, we had to stop by one more time before leaving the city. This time I ordered (yet another) croissant and hot chocolate combination and took a slab of chocolate and vanilla marble cake to go. The marble cake was actually probably the best thing I got from Cloud Cakes because it combined the chocolatey flavour of the brownie with the fluffiness of the cupcake and it was divine. Aside from all of my foodie plans, one place I was really excited to visit was the Shakespeare and Company bookshop (which was incredible, by the way). And my visit was made even better when I realised that the literary café attached to the bookshop had vegan options. The café rotates vegan treats on a daily basis so there's always a new option to try out! When we visited, I managed to bag the last vegan donut they had on display and, man was it a good one. Advertised as simply a 'vegan glazed donut' I wasn't sure what flavour sensation I was in for but, after taking a huge bite, I was very happy to discover that it was a coffee caramel donut that tasted bloomin' incredible. Like Cloud Cakes, I headed back to the Shakespeare & Co café one more time and opted for a pre-flight breakfast of a pb&j bagel and a hot chocolate which, while not quite as good as a donut, was still pretty tasty. As I'm sure you've gathered by now, most of our weekend in Paris was spent enjoying lots of on-the-go snacks whilst sight seeing but we did make time for one sit down meal while we were there. We decided to try out lunch at IT Trattoria, a casual pizza slash Italian deli style place, because the restaurant had exactly the chilled out vibe we wanted for a Saturday lunch. For my lunch I got a full 12" Marinara Pizza (basically a tomato garlic bread) and it only cost 3 euro & 50 cents so, for two large pizzas and two glass bottles of the most refreshing lemonade I've ever tried, we spent less than 10 euros (like, what?!). 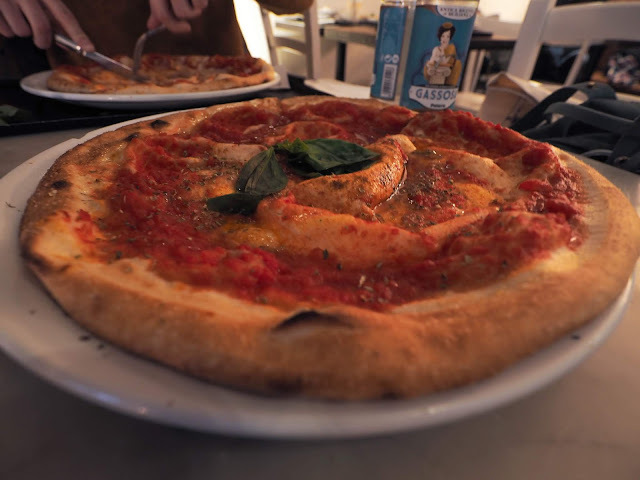 But despite being a cheap meal, the pizza totally hit the spot, it tasted super fresh and filled me up without leaving a greasy carb-coma feeling afterwards, which is exactly what I needed. Although I mentioned it briefly at the start of this post, it's also worth noting that I ate a lot of bread this weekend and, in fact, it was actually the first thing I set out to find after touching down in the city. 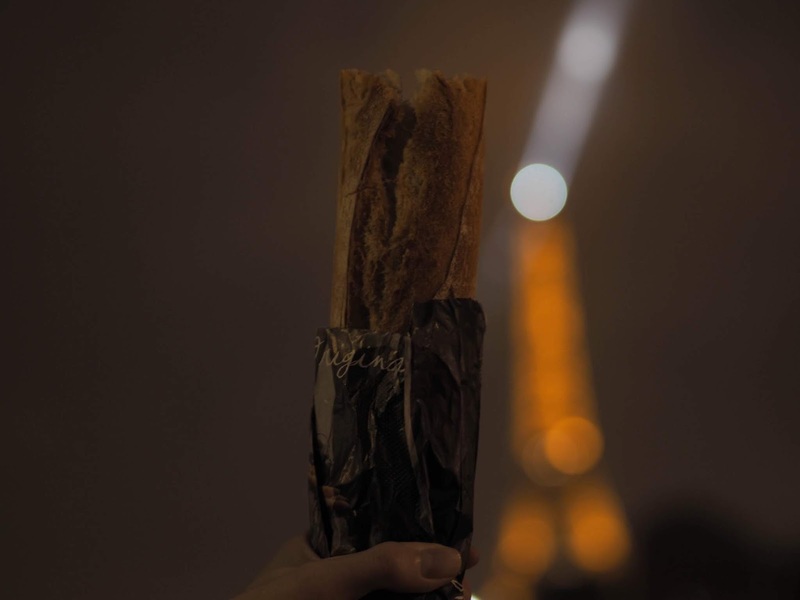 As it turns out, Parisian baguettes really are the best! They definitely kept me energised throughout the busy weekend and, I'd be lying if I said I didn't pack one in the suitcase to bring home (they were that good)! So, although I barely scratched the surface of all of the great vegan food Paris had to offer, those are just some of the epic treats I managed to scoff on my weekend in Paris.